In my world, humans encounter an alien species. They want to communicate verbally with each other, so I'd like to know what sounds could be shared by both species. When looking at the IPA chart, I came up with the following. Red is impossible, blue I'm not sure about, and black are shared by both species. The question is: Would this be correct? No glottis means no glottal sounds. However, I'm questioning what I marked out in blue. 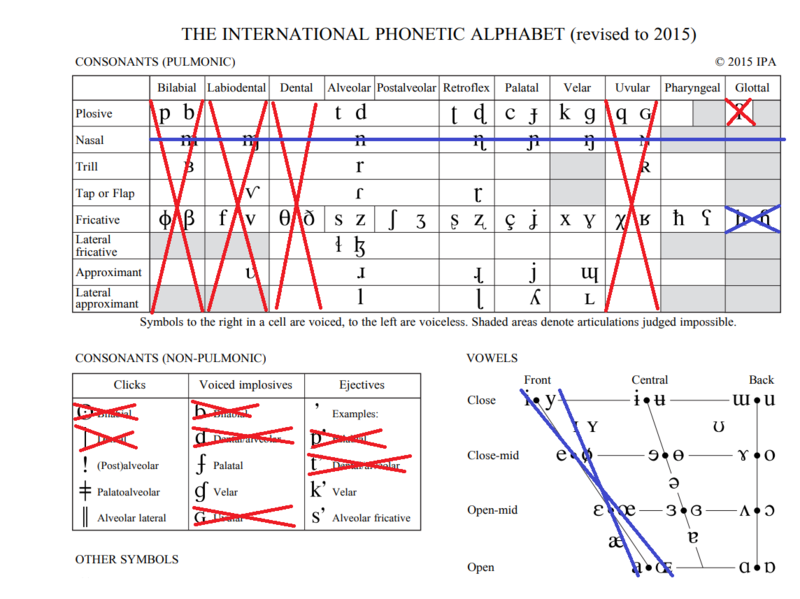 Fricative glottal sounds don't actually require the glottis so they should be fine? For vowels, as there's no obstruction required, front vowels could be fine as you wouldn't risk impaling your tongue like with dental sounds. The nasal sounds, however, are giving me the largest amount of trouble. While yes, without a nose making a nasal sound would be impossible. However, the resonance caused by the nose cavity could be substituted with humming/vibrating the mouth. After all, the resonance in the nasal cavity comes down to really just vibrating an empty cavity. I've tried, but it's very hard trying to shake off pronouncing /m/ and /n/ with my nose instead of my mouth. But in theory it would be possible, right? It might sound off (lower pitched as the mouth is larger), but it should be distinguishable as its own sounds. As an aside, I know there's more IPA letters than the charts I listed. EDIT: To clarify, I meant verbal communication, hence why I included an IPA chart. Sign language or any other means of communication could work, but I prefer the idea of verbal communication. As for the biology: assume the rest of the mouth is similar to that of humans. Hard and soft palate behind teeth, and a flexible and extendable tongue just like us. The only differences are the ones I explicitly listed. Note: The OP clarified the question in such a way that completely changes my answer. I am leaving my original answer below for reference, as it works well for a similar creature that doesn't have a tongue or closable lips, as the original picture showed and the original text implied. Your creature could make a fairly wide variety of sounds. Labial sounds come from the rapid closing and opening of the lips as the air flows to them from the inside, with some sounds possible without air flow. The size of the lips may alter the tenor but not the actual sound. As long as your creature has full and quick control of the lips (or where the lips would be) and the air flow can be completely cut off momentarily, you will have those sounds. Labial-Dental sounds do not require a tongue but do require front teeth that can fully or partially occlude the air flow while touching the lower lip. If the teeth look like the teeth in the picture, that's not really going to be possible. Dental sounds require the tongue against the top teeth, though can also be made with the bottom teeth or in-between both sets of teeth. They aren't going to be possible. But few languages have dentals. English is one and we do just fine talking with, say, native Spanish speakers who have good English except they just can't manage a "th." Alveolar sounds use the tongue at the ridge just behind the top teeth. No ridge means no alveolar sounds, but you might get an approximation. Palatal sounds come from the tongue interacting with various parts of the hard and soft palate and should be doable, if the teeth don't get in the way. Uvular sounds come from further back in the throat. If there is no uvula but the throat is otherwise shaped like a human's, these sounds will be either right or pretty close. The actual uvula is not involved in any serious way. Glottal sounds, and sounds from the throat in the area forward of it, should not be changed. Vowel sounds and liquids will be impaired if the teeth get in the way of the tongue, which looks likely based on the picture. You assume back vowels are okay and front ones are not, but it's not as easy as that. Tongues are pretty large and teeth like your picture will constrain where the tongue can move. Imagine someone with a swollen tongue speaking...it might be somewhat like that. If the tongue is smaller within the vocal cavity as compared to humans, it will also change the sound of the vowels, though they are probably still understandable with practice. Regardless of how (if) it works, the sounds that rely on the shape of the tongue in particular parts of the mouth are going to come out mangled. With practice, it should still be understandable speech. How well can we humans understand these creatures? Probably about as well as we understand understand drunk lispers who are chewing gum. Nearly every sound on the chart requires a tongue. You can shape a few sounds with just your mouth, assuming you have a good flow of air moving outwards, but no lips and no tongue means that you simply can not approximate a human spoken language. Your best bet is signed language, if the aliens have at least one arm and hand with fingers (5+ preferred). Two hands/arms are better but one will do. Granted, your picture and your description do not match. The picture has no tongue or palate (hard or soft), or any way to control the opening to the mouth. Your description does not mention a tongue, states teeth but does not say if they can close off the mouth like human teeth generally can. While you should edit your question to clarify, please do not change the premise of the question without making it clear it's an edit. While a species could certainly create a language with the physical constraints you have, it is not a language any human currently speaks. What you want is a syrinx like birds. It's the organ that allows birds to produce such varied sounds despite the fact that they have no lips and don't overly use the tongue to form sound. A separate organ further down the throat to produce sounds, which you can modify as you like in order to produce sounds like glottal stops if you so wish. Not the answer you're looking for? Browse other questions tagged science-based biology science-fiction language communication or ask your own question. Can the present human understand people in the past verbally? How would two alien races decipher each others language? What are ways plants might be communicating with one another without people realizing it? How would a language using colors and lights translate verbally? How well can a deaf person read lips? How would digestion work for an alien species with a diet of minerals? What's a good jaw and tooth build to break armor? Why would telepaths have difficulty communicating with each other?